WELCOME ABOARD MY CRUISE OF SOUTHEAST ALASKA! My first introduction to Alaska occurred in 1948 sailing up the Inside Passage on my uncle’s mission boat when I was 2 ½ years old. Although I’ve lived in New York State for 40 years, “Alassa,” my “love at first sight,” still calls to me. Growing up in a missionary family in Alaska in the fifties and sixties, I discovered Christian fiction. And thus began my lifelong relationship with books. In my early teens, I read the nine books of fiction written by my great aunt, under the pen name of Zenobia Bird. The desire to write Christian novels was born in my heart. After 25 years of writing short stories, articles, devotionals, and church school curriculum, in 2003, I published Frontiers of Faith, the story of my grandparents, Charles C. and Florence LeFevre Personeus, pioneer missionaries to Alaska for 65 years (1917-1982). As I researched that nonfiction book, I came across several incidents that triggered my imagination, and the idea for my Alaskan Waters Trilogy was conceived. 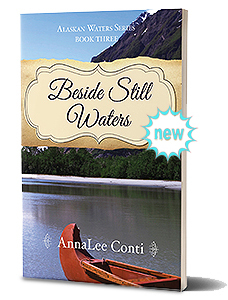 All of the books in this series, Till the Storm Passes By, A Star to Steer By, and Beside Still Waters, are now published in both e-book and trade paperback. While showcasing the majestic beauty of Alaska in my stories, I explore God's love and human love, forgiveness and reconciliation, rebellion and redemption, fear and faith—important themes I have struggled with in my own life and desire to share with you. I am thrilled to be accomplishing a lifelong goal. But my hope above all else is that you will come along with my characters on a life-changing journey to Alaska, "The Last Frontier," and find your faith in God renewed.